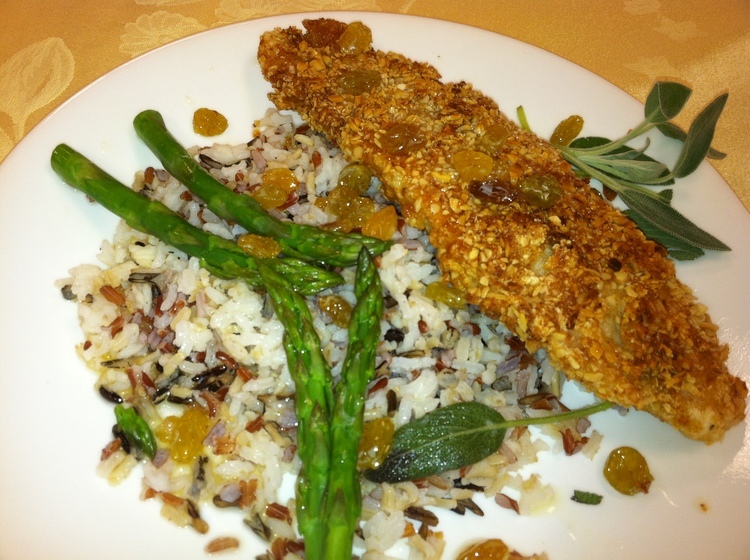 THIS ALMOND CRUSTED WALLEYE WITH GOLDEN RAISIN SAGE BEURRE NOISETTE WAS DELICIOUS! What makes this dish extra delicious is the Golden Raisin Sage Sauce or Golden Raisin Beurre Noisette. It couldn’t be easier and you will not believe the great taste you will get from this simple process. I did not use Walleye but catfish. I really want to try it with the Walleye. Let me know if you use Walleye and how you like it! 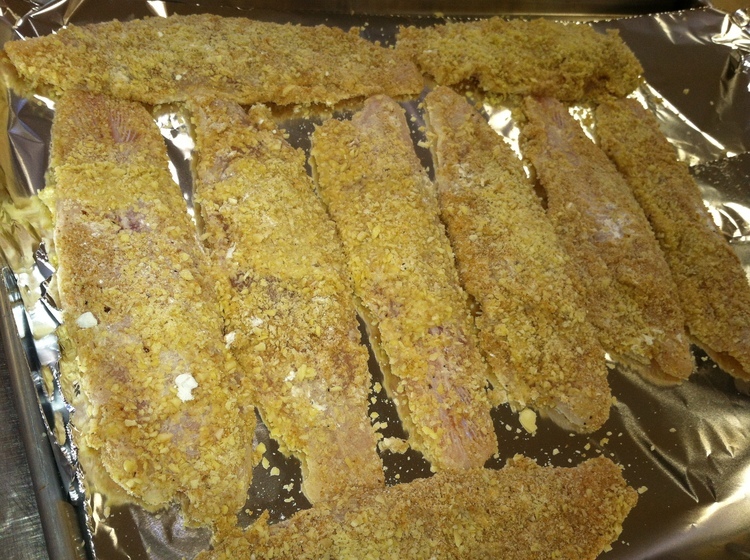 DIP THE FISH IN EGG, FLOUR, AND BREAD CRUMBS. THE FISH IS READY TO BE FRIED AND PLACED IN THE OVEN FOR ADDITIONAL BROWNING. 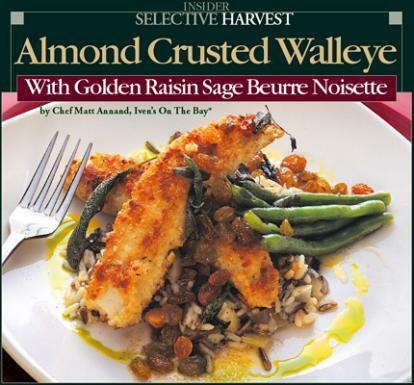 What makes this dish extra delicious is the Golden Raisin Sage Sauce Beurre Noisette (Beurre Noisette is French for brown butter).. Take fresh sage and cook in melted butter with raisins. What could be easier? THE FISH TURNED OUT NICE AND CRISPY AND THE SAGE BUTTER SAUCE WAS TO DIE FOR! 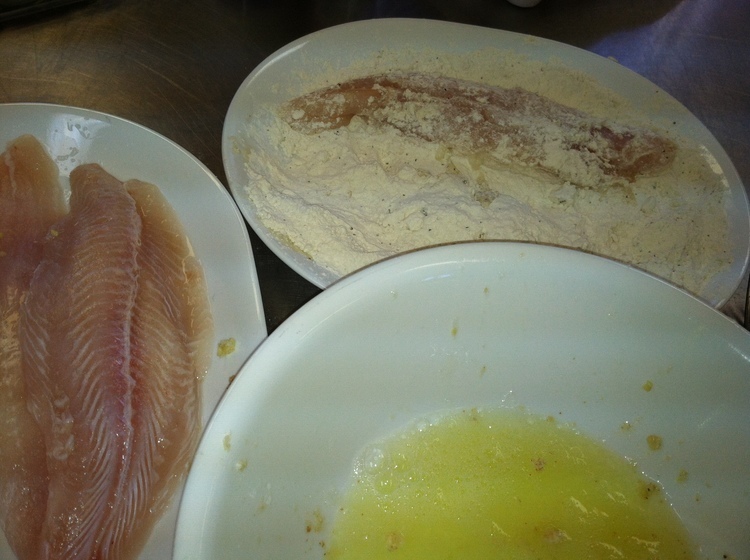 For each fillet, season the fillet with a little salt and dust with flour. Shake off excess flour. Dip the fillet in whipped eggs and then into medium-coarse processed breadcrumbs and almonds in equal parts. Saute until brown and then place in the oven for 5 minutes while you make the sauce. To finish . . . place the fillet over rice pilaf and top with Golden Raisin Sage Beurre Noisette. This beautiful preparation is a favorite during select seasons, at Iven’s On The Bay, in the heart of the Brainerd Lakes Area of Minnesota, home base for In-Fisherman. Dip the fillet in whipped eggs and then into medium-coarse processed breadcrumbs and almonds--equal parts. Saute over medium-high heat until each side is a golden brown, then place the fillet in a 375F oven for approximately 5 minutes. Finish with the sauce. In a hot pan, add 1/2 cup butter. As soon as the butter melts, add 1/4 cup golden raisins and 5 sage leaves. The butter browns quickly as the sage leaves crisp up and the raisins plump up. When the butter reaches a hazelnut brown color and is starting to foam, squeeze 1/2 of a lemon (carefully) in the mixture to stop the browning and finish the sauce.